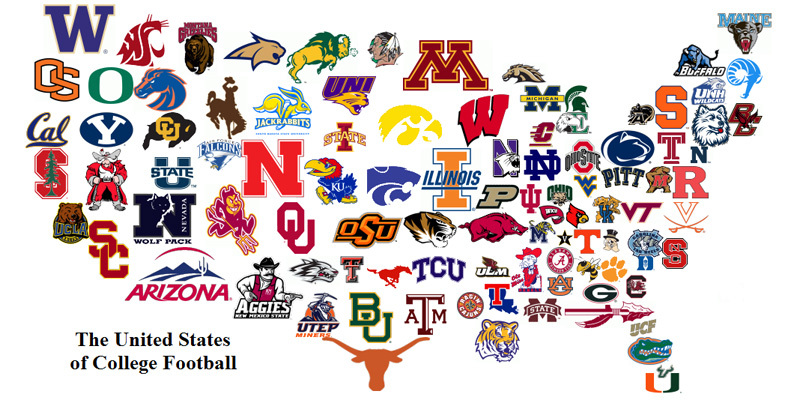 Only 82 more days until the 2015 College Football Season kicks off on September 5th. The new season is inching nearer, America, and there are a lot of growing developments taking place in the college football world. Summer is in full swing, schools around the nation are wrapping up graduation season, and beaches and barbecues are on the brain for most. For the die-hards out there, there are only questions of the happenings in the college football universe. Here’s a quick fix for the CFB junkies to keep the demons at bay for the time being. A few months ago Miami commit Al Blades Jr. made headlines for uploading a tweet of himself flashing the “U” while standing on the midfield Seminoles logo at Doak Campbell Stadium. Blades was on a recruiting trip despite already committing to Miami and one would probably think he wouldn’t be invited back to Florida State (FSU) anytime soon. Well, one would be wrong; Blades was back at FSU Thursday to participate in a camp hosted by Jimbo Fisher. Fisher had no idea about the tweet and even asked Blades if he had been to campus yet. This may come as a surprise to some, but Jimbo Fisher has been a longtime opponent of social media and even banned his team from using Twitter in 2012. Ron Douglas with his sons at the Nebraska vs Minnesota game in 2014. Ron Douglas was an iron man of the gridiron playing offense, defense, and punting for the Huskers in 1936. 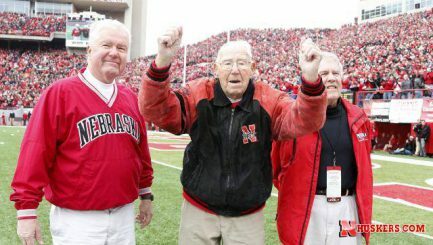 The oldest living member of the 1936 Nebraska football team passed away last Sunday at the age of 100. Douglas played alongside 1936 Heisman Trophy runner-up Sam Francis and first round draft pick Lloyd Cardwell. Douglas left a legacy at the university, as his two sons Ron Jr. and Roger both played baseball (Roger also earned a spot on the football team his sophomore year) and he was inducted in 1995 into the Nebraska Football Hall of Fame. Earlier this year Douglas was introduced at a basketball game. New head football coach Mike Riley sought him out and the two chatted extensively. Douglas passed away quietly in his hometown of Crete, Nebraska, where he spent all but three years of his life, surrounded by family and friends. 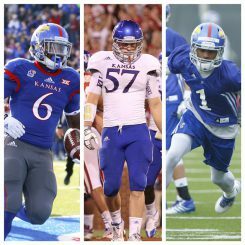 Running back Corey Avery (left) and receiver Rodriguez Coleman (right) have been dismissed from the KU football team. Linebacker Kyle Love (center) announced his retirement shortly after the dismissals were made official. New Kansas head coach David Beaty already had a large task in rebuilding a 3-9 Jayhawks football team; after a rough week that job just got a little harder. 2014 leading rusher Corey Avery and receiver Rodriguez Coleman were released by the team on Tuesday after being previously suspended for violating undisclosed team rules. Just to pour a little salt in the wound, potential starting linebacker Jake Love decided to call it a career in the very same week. Love was in line to take over for Ben Heeny, after Heeny was drafted by the Raiders in May. Obviously this is a huge problem for a Kansas team that is in desperate need of depth and had just one conference win over lowly Iowa State in 2014. That was with some serious talent in players like Heeny, corner JaCorey Shepherd and receiver Tony Pierson, who are all gone now. I think everyone should collectively wish Coach Beaty the best of luck. Ready? 1, 2, 3… nobody? College football might as well consider implementing a free agency process sometime soon. Kids are finding ways to get out of their scholarships and changing schools like it’s the thing to do these days. 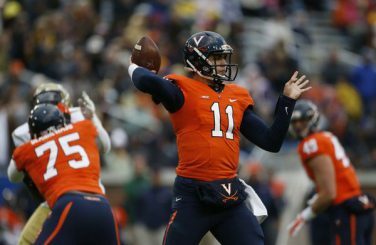 “Sorry kid, you didn’t win the starting job, maybe next year.” Players hear this phrase and now think, “I think it’s time for a change of scenery.” Greyson Lambert, formerly of Virginia, has joined the transfer club. Lambert failed to win the starting job from Matt Johns this spring after leading the Cavaliers to a 5-7 record, passing for only 1632 yards, and throwing 10 touchdowns to 11 interceptions in 2014. If Lambert were going to transfer, surely it would be to a MAC or Conference-USA program to benefit from the drop in competition. Instead Georgia head coach Mark Richt decided to take on the toiling quarterback. This is a confusing move for Richt – taking on a transfer like Lambert when many consider Richt to be on the hot seat after two lackluster seasons that saw the Bulldogs hit some serious adversity that they couldn’t overcome. The arrival of Lambert led to redshirt freshman Jacob Park deciding to transfer, which should further heat Richt’s already hot seat, pushing away a potential future starter in favor of Lambert, who is entering his senior season. In another addition to the growing number of cases of domestic violence in football, Arizona State linebacker Davon Durant is awaiting sentencing — due to occur Monday — after an altercation with his girlfriend last month. Durant was arrested when a witness called 911 and said that he saw Durant hit his girlfriend while sitting inside a vehicle. During his initial hearing, Durant pleaded guilty to disorderly conduct as part of a plea deal to drop three other charges including felony aggravated assault. A highly touted junior college transfer prospect, Durant was expected to compete for a starting role this season. That will likely be put on hold as he was immediately suspended after his arrest. 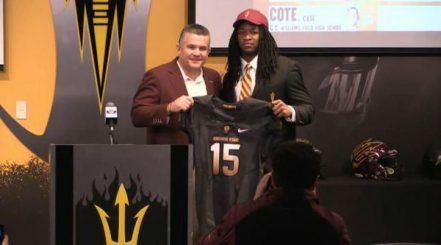 Despite his suspension, ASU’s Director of Player Development Marcus Walker filed a letter to the court vouching for Durant, writing “Davon has exemplified character, service, pride and leadership in everything he has done while being part of the Sun Devil program.” Durant faces up to six months in jail for the disorderly conduct charge and will likely attend domestic violence classes as part of his sentencing.